Female members of Parliament in Uganda, under their umbrella body, Uganda Women Parliamentary Association (UWOPA) have called for the immediate passing of the National Biotechnology and Biosafety Bill 2012 into law, to regulate biotechnology products that are developed in and/or imported into Uganda. During a seminar on biotechnology and biosafety at National Crops Resources Research Institute (NaCRRI), Namulonge on December 9, 2016, UWOPA Executive Member, Hon. 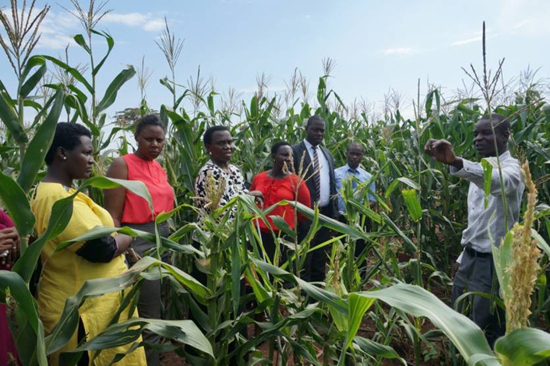 Margaret Baba Diri revealed that UWOPA members were concerned that the Bill and biotech processes such as genetic engineering were marred in controversy in the public space and yet such technology can boost food production in Uganda. "As women, we are producers of food and we are concerned that it is taking long to pass the Bill because of all the controversy. As women, we need to be able to produce for our families and we want to access improved crops that are pest and disease resistant but also do well in drought. We have come to Namulonge to get the truth so that we can support the Bill from an informed position", she said. Hon. Baba Diri, Woman MP for Koboko District and five time legislator lashed out at fellow parliamentarians for failing to give their constituents the right information about genetic engineering because they refuse to engage with the researchers and learn about biotech and how genetic engineering can empower their people. "All members of UWOPA were invited today to learn about genetic engineering and ask researchers the hard questions so that they get some truths, but some of our members are not here today", she noted. Another UWOPA member, Hon. Veronica Bichetero, MP for Kabermaido district, thanked Uganda Biotechnology Information Network (UBIC), NaCRRI and partners for disseminating information about biotechnology and biosafety, urging greater outreach to teach Ugandans about "this good technology". She stressed the need to pass the Bill, to regulate development and application of biotech products and allow researchers to develop GMOs that are relevant for Uganda. "Let us have the law. Let us have our own GMOs that work for us", she said. Hon Rosemary Nauwat, District Woman MP for Amudat district expressed her dismay because researchers have to destroy GM crops, once harvested and analyzed, instead of distributing it to the populace. UBIC Coordinator Dr. Barbara Zawedde, revealed to the MPs that the current biotechnology and biosafety policy only allows scientists to do research on GMOs; but the law will extend the lifeline of this research by allowing for release of GM crops to farmers. NaCRRI Director Dr. Godfrey Asea, noted that NaCRRI is using genetic engineering to address specific challenges where other known methods have hitherto fallen short. The seminar was attended by Members of Parliament from across the country. They toured the laboratories where GM research is undertaken, as well as the confined field test in a village. During the seminar, the MPs heard from Dr. Titus Alicai, Head of Root Crops Program that Uganda has been grappling with the problem of Cassava Brown Streak Disease (CBSD) for the last 70 years, and researchers have only been able to develop tolerant cassava varieties. Cassava varieties that are tolerant to CBSD are still susceptible to the disease, but the damage is less than the non-improved varieties. However, using genetic engineering, researchers at Namulonge have developed disease resistant varieties which cannot be destroyed by the virus. At a follow-up meeting for the UWOPA members, held on December 14, 2016, the members were urged to expand their discussion on the Bill because the law will regulate many other products of biotechnology and not just GMOs. At the end of the day, the women leaders unanimously vowed to ensure that the legislation is passed so that Ugandans can benefit from GM crops.